Hammer, ball peen, 8 oz. Hammer, soft face, 8 oz. Hex key set, ball-end, 12 pc. 6-3/4"; retaining ring, combination; slip-joint, 6". Punch pins (2): 1/16 and 3/32"
#1 x 6"; #2 x 4"
Screwdriver, slotted (5): 3/32 x 3"; 3/16 x 8"; 1/4 x 4"; 5/16 x 6"; 1/8 x 8"
Screwdriver set, jeweler's, 7 pc. Socket set, 3/8" drive, 23 pc. Wrench set, combination (9): 3/8-7/8"
Click the button below to add the Jensen Tools JTK-91MM Inch Electro-Mech. 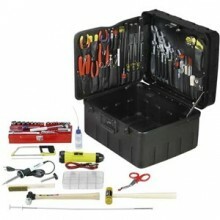 Installer's Kit in XR Rota-Tough Case to your wish list.